One of my very early contributions to GNOME was a flyer. FOSDEM 2014 was one of the first conferences I attended and with me I had brought printouts of this flyer which we handed out to people from the GNOME stand. That was 2 and a half year ago and the flyer has started to show its age. GNOME shell has received a lot of changes style-wise since then. We now have more well-defined brand colors and I learned a lot more about communication and visual design. So over the last three days I have worked out a new flyer. 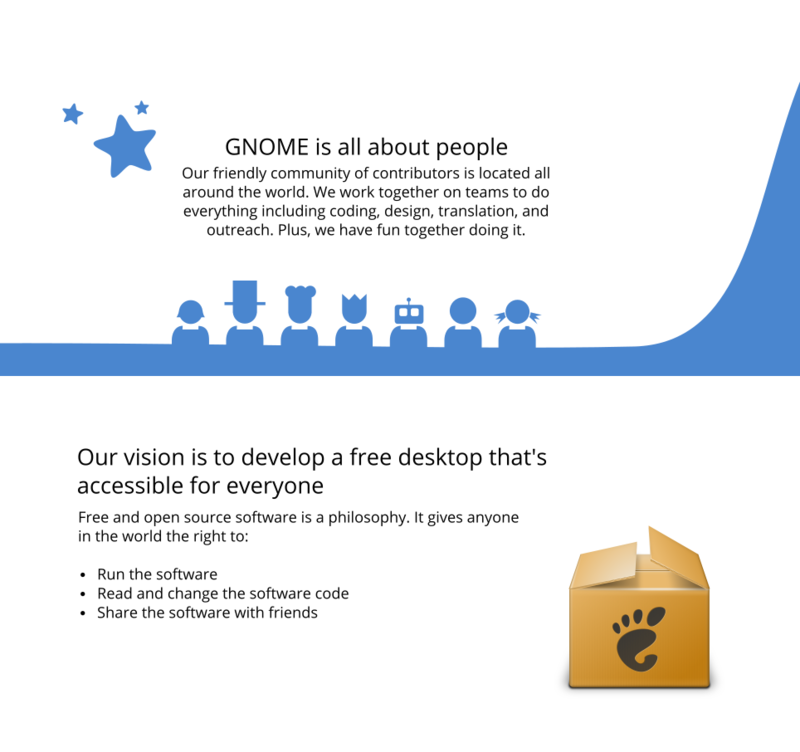 The flyer focus on presenting GNOME and our vision with the ultimate goal of reaching out to users and give them the initial motivation to participate in our awesome community. In the first two sections I focused on communicating GNOME in a tangible way. This is important because I feel the other information (vision, community etc) requires that you know what the fundamentals of what GNOME is in order to have impact. Furthermore attention is put on the user-visible aspects of GNOME – the shell and our applications. 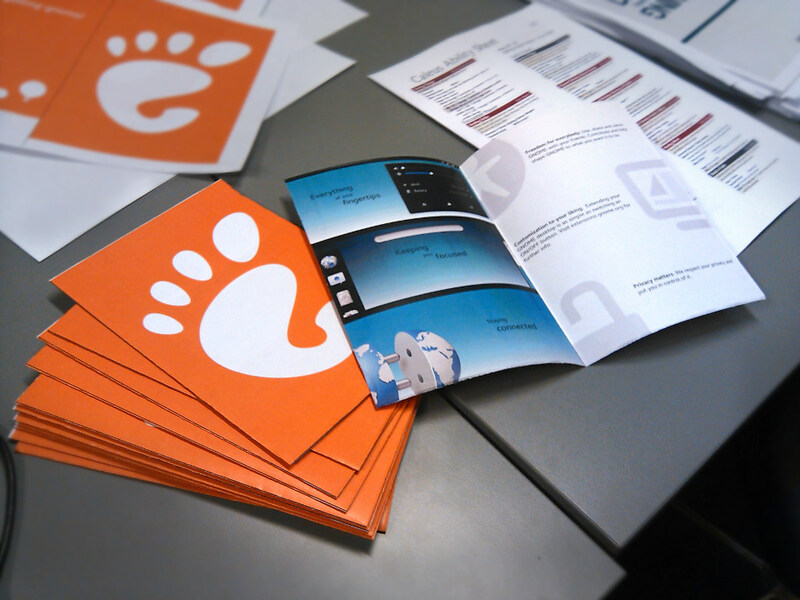 Hopefully someone who picks up a flyer might already recognize a few of the application icons shown in there. The rest of the flyer then moves onto explaining our vision and values. First section is there to introduce our community structure in GNOME. 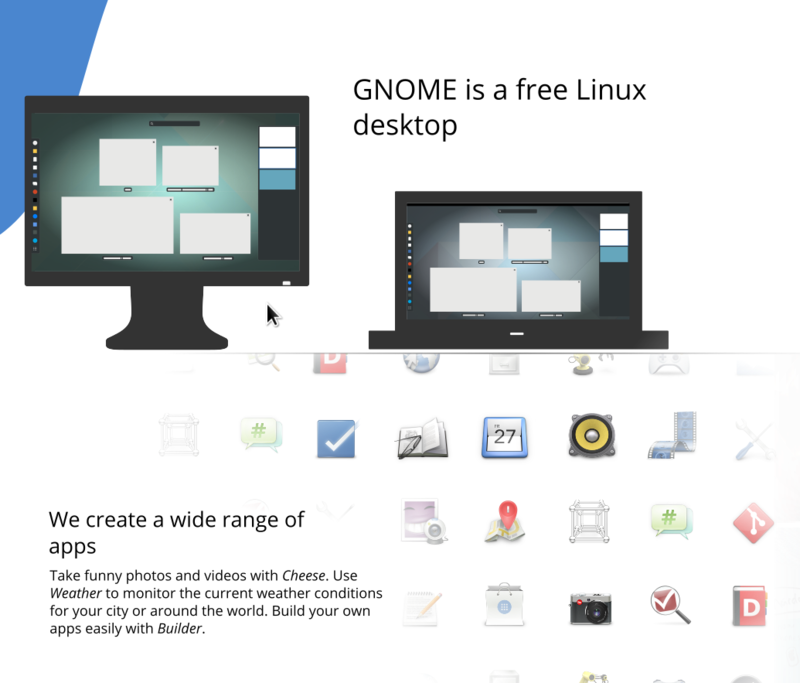 Second section is a (very) friendly version describing exactly what “free” means when we say that GNOME is a free desktop. The last section is about the more personal goals you can set for yourself which you can use when getting started as motivational factor for getting involved with GNOME. Initially you might want to do this in your free time to improving your skills, get more experience doing team work etc. My experience is that this motivation later is replaced by relational motivation factors as you start to bond with the community and partake in the team activities. The great photos shown in this section are taken by Carla Quintana Carrasco (thanks!). Finally, the flyer contains information on how to get involved – online and possibly via a local GNOME group. Is your local free software group doing an outreach event? Are you having a GNOME booth at a conference? Then this flyer is for you. I have uploaded it as a folder on engagement team’s gnome cloud where the source SVG’s and sample PDF’s are freely available for download (photos under CC-BY-NC 2.0, the rest CC-BY-SA 4.0). If you have a local group and plan on printing this for an event, I encourage you to edit the gnome-outreach-flyer-middle-pages.svg and add links to your web pages, contact information, social media etc. there before printing. 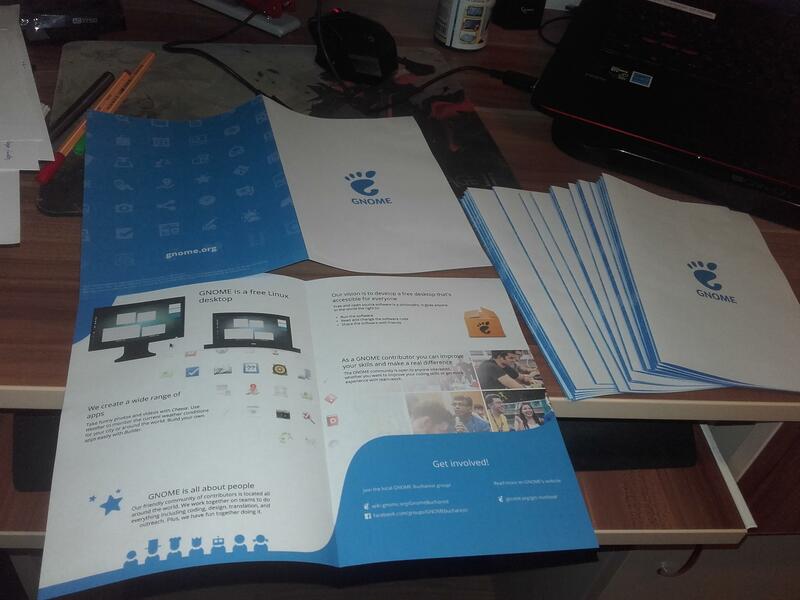 As an example see the gnome_flyer_bucharest.pdf. This iteration of the flyer is made to be printed out on a duplex A4 printer. I definitely recommend getting it printed at a print shop on some proper paper but otherwise the flyer is possible to print on any printer – you can specify 0mm bleed when saving the SVG as PDF from Inkscape. In other cases I have made margin big enough for 4-5 mm bleed (although I’m not sure how to make Inkscape do crop marks). Notice that the A4 page containing front and back has to be upside down for the end result to be correct. If you need to edit the front page you can use “Ctrl+A” and afterwards “V” will flip the contents vertically back and forth in Inkscape. Use a tool like PdfMod to join the front-back pdf with the middle-contents pdf and you are good to go. Make a separate page showing off pictures from our GNOME conferences and talk a bit about them. Have sections dedicated to talking about the different teams in GNOME such as translation, engagement, coding, etc. Have a dedicated page to possible local groups with more elaborate information and pictures of key persons in the group a newcomer might want to talk to. At the moment the flyer targets people who are already familiar with Linux. That might not always be the case so it might be wise to have (optional) pages dedicated to talk about Linux, gnu’s and penguins. If you have feedback or ideas yourself, do feel free to share them – this is first iteration. Thanks to Rares, Nuritzi and Alexandre and the rest of the engagement team for giving comments, feedback and encouragement for working on this! I wanted to try the latest version of Builder (gnome-builder 3.22) so I decided to install it with Flatpak. 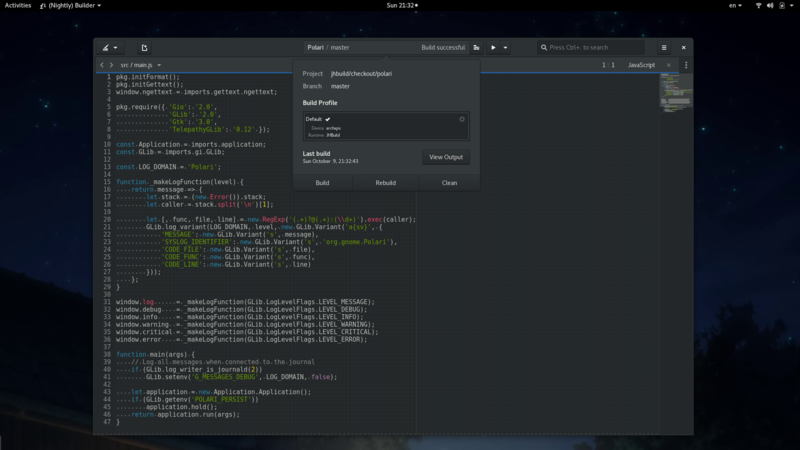 Here is a screenshot of GNOME Builder. EDIT: Sorry i had forgotten to add --user to all the commands, should be fixed now! EDIT2: in case you are wondering why the flatpakrepo and flatpakref is hosted on the gnome cloud space it’s because I haven’t gotten in touch with the right people to get official files up in the sdk.gnome.org space where they (imo) belong. stay tuned!